We’ve found the missing link. No, not the link between modern humans and apes or the professional wrestler of the same name, but one that some might say is far more important — the intermediary process by which the brain tells the gut to burn off its fat. And it’s not a moment too soon — the responsible hormone was first discovered back in 1931. In general terms, the process of metabolism — the chemical mechanisms that store or burn energy in an organism — and the way that the brain orchestrates this activity are well understood. Metabolism is linked to the activity of a prevalent neurotransmitter called serotonin. But until recently, explanations for how serotonin activity directed metabolism never developed beyond a general hunch. “I do not know why this has not been exploited more in mammalian studies,” says Robert Walker, a neurophysiologist who studies how the body processes energy. A team of scientists at the Scripps Research Institute found the hormone that triggers the gut to expend its stored fat by building on their earlier research. They had previously discovered that some hormone — released into the body by increased serotonin activity — was responsible, but they didn’t know what it was. However, they recently discovered that the hormone they were searching for is a compound called FLP-7. FLP-7 is a tachykinin — a class of protein that speeds up the heart and contracts smooth muscle tissue such as those found in the intestines. And even though tachykinins were discovered 86 years ago, no one has ever studied their role in metabolism. Back in 1931, Sir John Gaddum, an English pharmacologist, and Ulf von Euler, a Swedish physiologist and pharmacologist, were hunched over their lab bench at the National Institute for Medical Research, then located in Hampstead, London. Gaddum would later go on to found the British Pharmacological Society and von Euler would eventually win a Nobel Prize for his work on neurotransmitters, but at the moment they were hard at work. Inspired by the institute’s founder Sir Henry Dale, who discovered acetylcholine — the neurotransmitter that causes contractions when released onto skeletal muscles like those in our arms and legs — in the 1920s, Gaddum and Euler set out to test some extracted compounds on rabbit intestines. But what they found was puzzling. When they dropped extracts of what they thought would be acetylcholine — taken from the brain and intestines of a horse — onto their samples, Gaddum and Euler observed muscular contractions that were much slower than those caused by acetylcholine. These contractions were not negated by atropine, a chemical that blocks the effects of acetylcholine. This bizarre extract, it turned out, contained what would later be known as tachykinin, the class of proteins whose function would not be determined until almost 86 full years after this discovery, when the team from the Scripps Research Institute began analyzing their worms. To find the mysterious hormone, the Scripps team played a game of guess and check. 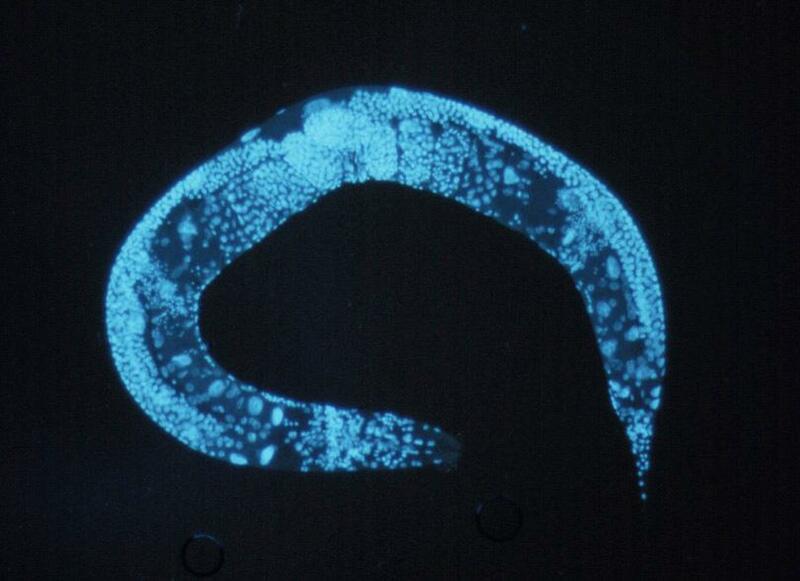 They conducted their research, which they published in Nature Communications in January, on a roundworm called C. elegans, which scientists frequently use as a model in biomedical research because it has a simple, well-understood genetic code and a transparent body that provides a direct window into its internal workings. They removed one hormone at a time until they found a roundworm that didn’t burn any fat — the cylindrical body never developing the washboard abs of its dreams. That’s how they figured out that it is FLP-7 that tells the gut to dig into its fat stores — when everything but FLP-7 was still in play, the team observed that this metabolic reaction never happened. The discovery of effortless weight loss would revolutionize the fitness industry, but it’s too soon to tout this discovery as the answer to a dieter’s prayers. It is possible that you might someday find FLP-7 in pharmaceuticals, but there’s a long, daunting road in between animal studies and FDA approval for human drugs. This research into the hormone, which had been overlooked by researchers for nearly a century, is only the latest in a long story of scientific discoveries. FLP-7 only gets released into the body when triggered by the neurotransmitter serotonin. The Scripps team knew that serotonin regulates appetite, energy consumption and some other unrelated processes such as reproduction. Because serotonin controls so many things, manipulating serotonin levels with the goal of burning off some fat can have widespread effects, not unlike trying to sink a ball in the corner pocket by lifting up and tilting the entire pool table. That’s why serotonin syndrome, a side effect of SSRI antidepressants such as Prozac — medications that boost the amount of serotonin in the brain — includes so many symptoms related to digestion and coordination, such as indigestion and muscle tremors. But because FLP-7 works downstream of serotonin, its presence or absence can trigger or prevent fat burning processes without changing anything else that serotonin would perturb, such as the roundworm’s motivation to consume food when hungry. Instead of messing with serotonin levels as a whole, isolating the role of FLP-7 allowed the Scripps team to line up their cue stick and make a careful shot to avoid sinking the eight ball — they can trigger fat burning without also lumping in any of the side effects. But the biomedical research techniques taken for granted in 2017 would have been totally alien to Gaddum and Euler in 1931 — serotonin itself wouldn’t even be discovered for another 17 years. They couldn’t use modern approaches to isolate and examine specific molecules. Rather, they relied on bioassays — the research technique they used in 1931 that involved placing extracts onto samples taken from animals — to observe the functions of chemicals. Bioassays were the gold standard from the 1920s until the 1950s, when scientists developed radioimmunoassays to better analyze a biological sample. And yet, even with these technological limitations, Gaddum and Euler discovered tachykinins for the first time on that day in 1931. In particular, they had discovered Substance P, a mammalian neurohormone that is very similar to the roundworm’s FLP-7 both in terms of structure and function. There is no easily traced linear progression of experiments and findings from that day at the National Institute of Medical Research to today, but these two scientists influenced an entire generation of pharmacologists who got to work investigating tachykinins and other molecules. “I could point to practically any British pharmacologist over the age of 70 as being in the lineage of Gaddum,” says Tilli Tansey, a medical science historian at the Queen Mary University of London and the archivist of the Physiological Society, of which both Euler and Gaddum were members. But still, the trail from 1931 to today is convoluted, full of speed bumps and breaks in research. With the state of technology what it was, researchers were stuck analyzing activities via bioassays, so it would have been impossible to accomplish what the team from the Scripps Research Institute did with radioimmunoassays. The link between tachykinins and metabolism would elude scientists for several more decades. When World War II started in 1939, work at the National Institute of Medical Research was halted and its new facility, located at Mill Hill, was turned over to the Women’s Royal Naval Service. “The war intervened and people moved on,” says Iain Robinson, the former head of Molecular Neuroendocrinology at the National Institute of Medical Research. The scientists didn’t get their labs back until 1949. By then, many researchers had lost interest. “The field of substance P went into a bit of a wasteland, and it became rather unfashionable to study ‘dirty’ tissue extracts until methods were developed to purify and identify the components in the ‘60s,” says Robinson. As technology advanced, the next generation of endocrinologists, notably Andrew Schally, Roger Guillemin and Wylie Vale worked to purify, identify and analyze various molecules in the 1960s. Their research laid the groundwork for the link between the nervous system and the endocrine system — namely, how neurohormones released by the brain acted upon their targets elsewhere in the body. In this case, FLP-7 travels to the intestines, where it instructs the body to burn through its stored fat. Finally, a technique that allows researchers to determine the specific DNA sequences of various genes was developed in 1977. This technology, called Sanger sequencing, represents a paradigm shift from the earlier days of dropping chemicals onto samples and watching what happens. In the modern era of biomedical research, vast amounts of genetic material can be analyzed with increasing precision and speed. Sanger sequencing, which allowed the International Human Genome Project — first proposed in 1989 and completed in 2003 — renewed interest in neurohormone research, resulting in the trail of developments that brings us to present day. Now scientists can use unlimited amounts of DNA’s basic ingredients to isolate and record the genetic sequence of any organism. Still, even with new tools like Sanger sequencing at a scientist’s fingertips, it took another 40 years before FLP-7’s role in burning fat was discovered. Tachykinins were primarily studied for their roles in the body’s ability to feel, perceive and react to pain rather than their involvement in metabolism. So science didn’t miss the trail by not finding the role of tachykinins in metabolism sooner. Rather, it meandered along, frequently stepping on the heels of basic research’s slow march onwards. “I don’t think scientists have taken a wrong turn. But, rather, they have found so many other important roles for tachykinins that they have overlooked a link with metabolism, which might turn out to be very important,” says Walker. It’s far too early to start talking about some miracle cure for human weight loss. Biomedical research is a graveyard littered with the corpses of animal studies that failed to generalize to humans. Even with some notable similarities between the hormonal systems of roundworms and humans, it is the norm rather than the exception that research on a model organism — be it a roundworm or any other — doesn’t end up translating into human relevance. For example, breakthrough cancer medications always generate hype when they kill tumors in lab rats, but they rarely work in humans. While any potential applications are largely speculative, the researchers at the Scripps Research Institute are confident that their discovery is the exception rather than the norm. Because the genetic code for roundworms is so simple and well known, manipulations are relatively simple for researchers to do. For example, after determining that FLP-7’s natural receptor was a protein called NPR-22, they altered the genes of a roundworm to include NK2, a receptor that binds with tachykinins but is found in mammals. Roundworms that contained both kinds of receptors were able to metabolize fat unless both receptors were blocked. This means that FLP-7 could work on both the unaltered roundworm and mammals.